Congratulations to Dr. Phil Gale, who was appointed Penn Manor’s assistant superintendent for secondary education at the Nov. 6 school board meeting. Currently principal of Penn Manor High School, Gale will take over as assistant superintendent July 1, 2019, upon the retirement of Cheryl Shaffer. Principal of the high school since 2009, Gale previously served as dean of students, assistant principal and associate principal at the school. Before joining the Penn Manor staff in 2000, he was a social studies and science teacher at schools in Pennsylvania and Massachusetts. Gale received his doctorate in educational leadership from Immaculata University in 2012, his master’s in education leadership from Millersville University in 2001 and his bachelor’s degree in social studies from Elizabethtown College in 1993. “Dr. 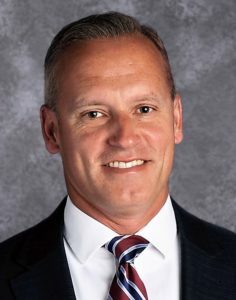 Gale is a dynamic leader with a proven track record of results during his tenure at Penn Manor High School,” said Dr. Mike Leichliter, Penn Manor superintendent. “His leadership and commitment to raising expectations and standards for all students will be a welcome addition to our district-level leadership team,” he said. Penn Manor will begin a search for a new high school principal later this school year. Please join us in welcoming Dr. Gale to his new position.